This page provides an overview of the divine and mortal children fathered by the god. Most of these were connected to him with only a brief genealogical reference and his paternity was usually assigned to emphasize a brutal or warlike nature. A few were the mythic founders of certain royal and noble houses such as Queen Harmonia of Thebes and King Porthaon of Kalydon. The quotes on this page are merely a collection of odd genealogical references. For actual myths featuring Ares, his loves and children see the "Ares Loves" and "Ares Favour" pages. ANTEROS God of reciprocated love (or contrarily of unreciprocted love), son of Ares and Aphrodite. DEIMOS God of fear, a son of Ares and Aphrodite. ENYALIOS (Enyalius) A war-god son of Ares and Eris. EROS God of love, a son of Ares and Aphrodite. HARMONIA Goddess of harmony, daughter of Ares and Aphrodite. PHOBOS God of panic, son of Ares and Aphrodite. AEROPOS (Aeropus) A lord of Tegea, Arkadia (southern Greece), son of Ares and Aerope. ALKIPPE (Alcippe) A girl of Athens, Attika (southern Greece), daughter of Ares and Agraulos, who was raped by Hallirhothios, a son of Poseidon. Ares slew him for the crime and was acquitted of murder in the Areopagos. AMAZONES (Amazons) Warrior women of Assyria (Asia Minor), daughters of Ares and Harmonia. ANTIOPE An Amazonian princess or queen, daughter of Ares and Otrere. She was abducted by Theseus during Herakles'quest to obtain the belt of her sister Antiope. ASKALAPHOS (Ascalaphus) A king of Orkhomenos (icentral Greece), son of Ares and Astyokhe. With his brother Ialmenos he led his people during the Trojan War. Ares sorely grieved his death during the conflict. DIOMEDES A king of Bistonia in Thrake (north of Greece), son of Ares and Kyrene or Asterie. He was slain by Herakles who was sent to fetch this barbaric king's herd of man-eating mares. DRYAS A lord of Kalydon, Aitolia (central Greece), and son of Ares (or according to others of Iapetos). EUENOS (Evenus) A lord of Aitolia (central Greece), son of Ares and Demonike; OR (in another version of his story) a Lord of Elis, son of Ares and Sterope (and so brother of Oinomaos King of Pisa). HIPPOLYTE A queen of the Amazones, daughter of Ares and Otrere. She was slain by Herakles in his quest to fetch her belt as one of the Twelve Labours. IALMENOS (Ialmenus) A king of Orkhomenos (central Greece), son of Ares and Astyokhe. With his brother Askalaphos he led his people during the Trojan War. KYKNOS (Cycnus) A barbaric lord of Makedonia or Thessalia (northern Greece), son of Ares and Pelopia or Pyrene. He was slain by Herakles in single combat, despite the personal intervention of his father Ares. LIKYMNIOS (Licymnius) A lord of Thebes (central Greece), and according to some a son of Ares (most say his father was King Elektryon). LYKASTOS (Lycastus) An Arkadian (southern Greece) lord, son of Ares and Phylonome. LYKOS (Lycus) A barbaric king of Libya (North Africa) and son of Ares who used to sacrifice strangers to his father. MELANIPPOS (Melanippus) Founder of the town of Triteia, in Akhaia (southern Greece), son of Ares and Triteia. MELEAGROS (Meleager) A prince of Aitolia (central Greece), who, according to some was a son of Ares and Queen Althaia (but most call him a son of King Oineus). MOLOS (Molus) An Aitolian lord (central Greece) and perhaps king of Molossia (North-West Greece), son of Ares and Demonike. NISOS (Nisus) A king of Megara (southern Greece), who, according to some was a son of Ares (but most accounts say he was a son of the Athenian prince Pandion). OIAGROS (Oeagrus) A king of Pieria (northern Greece) and, according to some, a son of Ares (though according to others his father was King Kharops). OINOMAUS (Oenomaus) A brutal king of Pisa, in Elis (southern Greece), and son of Ares and the Pleaid Sterope or Princess Harpinna. OXYLOS (Oxylus) A lord of Aitolia (central Greece), son of Ares and Protogeneia. PARRHASIOS (Parrhasius) An Arkadian (southern Greece) lord, son of Ares and Phylonome. PARTHENOPAIOS (Parthenopaeus) An Arkadian (southern Greece) prince, son of Ares and Atalanta (many, however, say his father was Melanion or Meleagros). PENTHESILEIA A queen of the Amazones (Asia Minor) and daughter of Ares and Otrere. She led her people during the Trojan War and was slain by Akhilleus. Ares deeply mourned the death of his daughter. PHLEGYAS A warlike king of Phlegyantis, a kingdom identified with both Trikke-Oikhalia in Thessalia (northern Greece) and Orkhomenos (central Greece). He was a son of Ares and Dotis or Khryse. PORTHAON A king of Aitolia (central Greece), son of Ares (or according to others of Agenor). PYLOS (Pylus) An Aitolian lord (central Greece) and perhaps king of Pylos (southern Greece), son of Ares and Demonike. REMUS A king of Latium (central Italy), son of Ares and Ilia. He founded the city of Rome. ROMULUS A king of Latium (central Italy), son of Ares and Ilia. He founded the city of Rome. TEREUS A brutal and barbaric king of a Thrakian tribe (norther of Greece), and a son of Ares. THESTIOS (Thesius) An Aitolian lord (central Greece), perhaps the King of Pleuron, son of Ares and Demonike (or of Agenor and Epikaste). THRASSA A queen of the Triballoi tribe of Thrake (north of Greece), daughter of Ares and Tereine. DRAKON ISMENIAN A monstrous dragon-serpent which guarded the Ismenian Spring of Thebes (in Boiotia, Central Greece) and was slain by the hero Kadmos. It was a son of Ares and the Erinys Telphousia. "Sons of Mars [Ares]. Oenomaus by Sterope. Harmonia by Venus [Aphrodite]. Lycus. Diomedes, the Thracian. Ascalaphus. Ialmenus. Cycnus. Dryas." LOVED : 1 - 5. Aphrodite, goddess of love; 6. Eris, goddess of strife. FATHERED : 1 - 2. Deimos & Phobos, gods of Fear & Terror; 3. Eros, god of love; 4. Anteros, god of love returned; 5. Harmonia, goddess of harmony; 6. Enyalios, war-god. LOVED : 1. Agraulos, princess of Athens. FATHERED : 1. Alkippe, lady of Athens. "Agraulos [daughter of Kekrops king of Athens] and Ares had a daughter Alkippe." "[Ares] killed [Halirrhothios] because he had raped Alkippe, his daughter with Agraulos the daughter of Kekrops, as Hellanickos says in [book] one." FATHERED : 1. Nisos, king of Megara. "Nisus, son of Mars [Ares], or as others say, of Deion, and king of the Megarians." "Men who committed suicide . . . Nisus, son of Mars [Ares], when he lost his fatal lock of hair, killed himself." LOVED : 1 - 2. Sterope, Pleiad nymph; 1. Harpina, Naiad nymph. FATHERED : 1. Oinomaos, king of Pisa; 2. Euenos, Eleian lord. 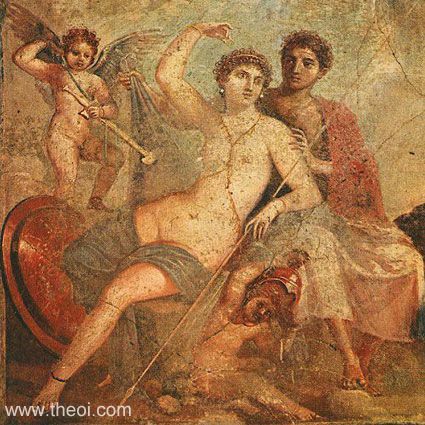 "Oinomaos was the son of Alxion (though poets proclaimed his father to be Ares, and the common report agrees with them) . . . lord of the land of Pisa." "Harpina [daughter of the River-god Asopos], who, according to the tradition of the Eleans and Phliasians, mated with Ares and was the mother of Oinomaos, king around Pisa." "In the city of Pisa in the Peloponnesos Ares lay with Harpine, the daughter of Asopos, and begat Oinomaos." "Oinomaos . . . is hurriedly sacrificing to his father Ares, this man of savage aspect and with murder in his eye." "Oenomaus, son of Mars [Ares] and Asterope, daughter of Atlas." "Sons of Mars [Ares]. Oenomaus by Sterope." "Oenomaus, son of Mars [Ares]." "Teams which destroyed their drivers . . . [those of] Oenomaus, son of Mars [Ares] by Asterie [Asterope], daughter of Atlas." "The Pleiades are called seven in number, but only six can be seen. This reason has been advanced, that of the seven, six mated with immortals, three with Jove [Zeus], two with Neptunus [Poseidon], and one with Mars [Ares] . . . Mars [Ares] by Sterope begat Oenomaus, but others call her the wife of Oenomaus." LOVED : 1. Triteia, sea nymph. FATHERED : 1. Melanippos, lord of Triteia. "Ares mated with Triteia the daughter of [the Sea-God] Triton, this maiden was priestess to Athena, and that Melanippos, the son of Ares and Triteia, founded the city [Triteia, Akhaia] when he grew up, naming it after his mother . . . The people here are accustomed to sacrifice both to Ares and to Triteia." LOVED : 1 - 2. Phylonome, princess of Arkadia; 3. Aerope, princess of Arkadia; 4. Atalante, princess of Arkadia. FATHERED : 1. Lykastos, lord of Lykastos; 2. Parrhasios, lord of Parrhasios; 3. Aeropos, Arkadian lord; 4. Parthenopaeios, Arkadian lord. "To Melanion or Ares she [Atalante] bore Parthenopaios, who went on the expedition [of the Seven] against Thebes." LOVED : 1. Erinys Telphousia (perhaps Demeter). FATHERED : 1. Ismenian Drakon, serpent of Thebes; 2. Likymnios, Theban lord. LOVED : 1 - 5. Demonike, princess of Pleuron; 6. Althaia, queen of Kalydon; 7. Protogeneia, princess of Kalydon. FATHERED : 1. Porthaon, king of Kalydon; 2. Thestios, king of Pleuron; 3. Pylos King of Pylos; 4. Molos, king of Molossia; 5. Euenos, Aitolian lord; 6. Meleagros, prince of Kalydon; 7 Oxylos, Kalydonian lord; 8. Dryas, Kalydonian lord. These sons of Ares born in Pleuron became kings of Pleuron, Kaldyon, another Aitolian kingdom, Molossia, and Pylos. "Oineus son of Portheus son of Ares, was king of Kalydon." "Althaia [daughter of Thestios] also bore a son named Meleagros to Oineus, although some hold that the father was Ares." "Ares consorted with Althaia and begat Meleagros . . . So says Euripides in his Meleagros." "Argonauts assembled: . . . Meleager, son of Oeneus and Althaea, daughter of Thestius; some think son of Mars [Ares], a Calydonian." "Oeneus and Mars [Ares] both slept one night with Althaea, daughter of Thestius. When Meleager was born from them, suddenly in the palace the Fates [Moirai], Clotho, Lachesis, and Atropos, appeared." "Marvortius [Meleagros son of Ares], outraged beyond endurance, bursting in anger, shouted [at his uncles, the brothers of Althaia]." "Protogeneia [the daughter of Kalydon king of Kalydon in Aitolia], who with Ares produced Oxylos." "[Hunters of the Kalydonian Boar:] Oineus' son Meleagros, and Dryas, son of Ares (both from Kalydon)." "Sons of Mars [Ares] . . . Dryas." LOVED : 1. Khryse, princess of Phlegyantis; 1. Dotis, Boiotian lady. FATHERED : 1. Phlegyas, king of Phlegyantis. Phlegyantis was a kingdom identified with both Trikka in western Thessalia, and Orkhomenos in northern Boiotia. "Lykos, the brother of Nykteus, these two [Theban] brothers were fugitives for having slain Phlegyas, son of Ares and Dotis of Boiotia." "Tradition has it that Khryse, daughter of Almos, had by Ares a son Phlegyas, who, as Eteokles [king of Orkhomenos and/or the Phlegans] died childless, got the throne." LOVED : 1. Pyrene, Thrakian lady; 1. Pelopia, lady of Itonos in Thessalia. FATHERED : 1. Kyknos, Thrakian lord or lord of Itonos. "It was he, Herakles, who killed Kyknos, high-hearted son of Ares." "Herakles set out and reached the river Ekhedoros [in Makedonia], where he was challenged to a duel by Kyknos, son of Ares and Pyrene." "As he passed Itonos Herakles was challenged to a duel by Kyknos, son of Ares and Pelopia." "Sons of Mars [Ares] . . . Cygnus." "Cygnus, son of Mars [Ares], whom Hercules killed." "In these Games [the funeral Games of King Pelias] . . . Cygnus, son of Mars [Ares], with weapons killed Pilus, son of Diodotus." FATHERED : 1. Oiagros, king of Pieria. According to some Oiagros King of Pieria was a son of Ares. LOVED : 1. Kyrene, Naias nymph; 1. Asterie, nymph; 3. Teirene, Naias nymph. FATHERED : 1. Diomedes, king of the Bistones; 2. Tereus, king of Thrakian tribe; 3. Thrassa, queen of the Triballoi; 4. Alkon, Thrakian lord. "Sons of Mars [Ares] . . . Diomedes, the Thracian." "Pandion [king of Athens] solicited help from Ares' son Tereus in Thrake [in his war against Thebes], and after he had set the matter straight with Tereus' assistance, he gave him his daughter Prokne to marry." "Tereus, son of Mars [Ares], a Thracian . . . thinking that his brother Dryas was plotthing his son's death, he killed the innocent man." "Sons of Mars [Ares] . . . Diomedes the Thracian." "Tereus, son of Mars [Ares]." "Tereus of Threicia (Thrace) . . . traced his lineage from Gradivus [Ares] himself." "Thrassa was daughter of Ares and of Tereine daughter of Strymon." "Those Who Hunted the Calydonian Boar . . . Alcon, son of Mars [Ares], from Thrace . . . Dryas, son of Iapetus." LOVED : 1. Harmonia, nymph; 2 - 4. Otrere, queen of the Amazones. 4. Penthesileia, queen of the Amazones. "[Herakles] slew Hippolyte, daughter of Mars [Ares] and Queen Otrera, and took from her the belt of the Amazon Queen; then he presented Antiopa as captive to Theseus." "Men who killed their wives . . . Theseus, son of Aegeus, killed Antiopa, the Amazon, daughter of Mars [Ares], because of an oracle of Apollo." "The temple of Diana [Artemis] at Ephesus which the Amazon Otrera, wife of Mars [Ares], made." "The Amazon Penthesileia, the daughter of Ares and of Thrakian race, comes to aid the Trojans, and after showing great prowess, is killed by Akhilleus and buried by the Trojans." "Then came [Penthesileia] the Amazon, the daughter of great-souled Ares the slayer of men." "Challenging combatants and their adversaries [in the Trojan War] . . . The same [Akhilleus] with Penthesilea, daughter of Mars [Ares] and Otrera; Penthesilea was killed." FATHERED : 1. Lykos, Libyan king. "After the sack of Troy Diomedes was cast upon on the Libyan coast where Lykos was king, whose custom it was to sacrifice strangers to his father Ares . . . So says Juba in the third book of his Libyan History." "Offspring of Mars [Ares] . . . Lycus." LOVED : 1 - 2. Ilia (Rhea Silvia), princess of Latium. FATHERED : 1 - 2. Romulus & Remus, co-kings of Latium. "Those suckled by animals . . . Romulus and Remus, sons of Mars and Ilia, by a she-wolf."